Stunningly picturesque Varkala beach provides a relatively peaceful alternative to the now commercialized Kovalam. The setting of this beach is striking enough to take your breath away, with a long winding stretch of cliff and views that extend over the Arabian Sea. A paved footpath runs along the length of the cliff, bordered by coconut palms, quaint shops, beach shacks, hotels, and guesthouses. Nestled at the bottom of the cliff is a long stretch of sparkling beach, reached by steps leading down from the cliff top. Varkala is located south of Kollam, around one hour north of Trivandrum (Thiruvananthapuram), in India's southern state of Kerala. Varkala cliff and beach are located a 10-minute drive away from Varkala town and railway station. Almost 20 Indian Railways trains stop at the station. If coming by train, take an auto-rickshaw from the station for about 100 rupees. Alternatively, there are airports at Trivandrum (an hour south of Varkala) and Kochi (around 4 hours north of Varkala). Varkala's climate is very tropical and humid. It receives rain from both the southwest and northeast monsoon, which produce intensely heavy downpours. The rain is at its worst from June to August and late October to December. Late December to March are the best months to visit, because the weather is dry and sunny every day, and the temperature hovers around 30 degrees Celsius (86 degrees Fahrenheit). The summer months of April and May become very humid and hot, with temperatures around 35 degrees Celsius (95 degrees Fahrenheit). Varkala is a wonderful place to relax and rejuvenate. It's well known for its dramatic sunsets. Settle into one of the beach shacks with a drink, and you'll have an uninterrupted view of the sun as it slowly sinks down the horizon. The mineral spring that flows from the cliff at the southern end of the beach is believed to have medicinal properties. You'll also find plenty of places specializing in yoga and Ayurvedic therapies. Yoga with Haridas classes are popular at the Green Palace Hotel on the cliff. Absolute Ayurveda is recommended for Ayurvedic treatments, as too are Sanjeevani Ayurveda and Yoga Center and Ayushi Ayurvedic Retreat. Meditation and art/creative workshops are also offered from time to time. Shop 'til you drop at the endless rows of shacks lining the North Cliff, stocking everything from jewelry to handicrafts. Alternatively, get surfing lessons at Soul and Surf. They offer accommodations as well. Around Varkala, it's possible to take a canoe trip along the backwaters or walk 1.5 hours north to deserted Kappil beach along an oceanfront promenade. Varkala's main beach is called Papanasam Beach, which means destroyer of sins. It's divided into two parts -- North Cliff and South Cliff. South Cliff is less crowded and much quieter than North Cliff. The beach at the end of the road leading from Janardhana Swamy Temple is considered sacred to Hindus. It's where they come to perform the last rites after close relatives have died. North Cliff is the most touristy part of the beach, located past the mineral spring. The pathway that runs along this stretch is where most of the shops, restaurants, and accommodations are situated. Further to the north, where the cliff ends past Papanasam Beach, is another small beach with black sand (affectionately called the Black Beach). Just further north of Black Beach, quiet Odayam Beach is just starting to be discovered and developed. Head there if you want peace and quiet away from the action. From there you can walk further north up a coastal path to Edava Beach. Varkala has plentiful accommodations to suit all price ranges, from resorts to simple rooms in family homes. On quieter Odayam Beach around 10 minutes walk from the cliff, if you feel like splurging, Palm Tree Heritage has top quality rooms from 4,000-9,000 rupees. In the same area, Palm Tree Bungalow, Blue Water Beach Resort, and Maadathil Cottages all have gorgeous (but pricey) cottages with ocean views. Magnolia Guesthouse is a budget option in the area, with rooms starting from around 2,000 rupees per night. They offer two bedroom cottages and a three bedroom apartment too. Also check out Mint Inside Beach Hotel, in the same price range. You'll find some decent, inexpensive places set back from the cliff. Attractive Kaiya House is a boutique hotel run by a lovely foreigner-Indian husband and wife team. Expect to pay around 2,000 rupees a night. Akhil Beach Resort has a swimming pool, glorious garden, and rooms for under 2,000 rupees per night. Keratheeram Beach Resort is a highly rated budget option, with rooms starting from around 1,000 rupees a night, depending on the time of year. Jicky's Nest, in the Helipad area, offers comfortable no-frills accommodations from around 900 rupees per night. If you're really on a budget, try Vedanta Wake Up! hostel. If you want to stay right on the cliff, Varkala Marine Palace is good value, with rooms, cottages, and apartments starting from 1,800 rupees per night. Hill View Beach Resort is conveniently located close to the steps that lead down to the beach, next to Cafe Del Mar. Rates start from around 2,500 rupees per night. For clean and peaceful homestay accommodations, head to Gumnut Beach House near the beach at South Cliff, or Indigo Homestay behind the North Cliff. The nightlife in Varkala is quite laid back. Some beach shacks, such as Rock n Roll, do have parties and play music late into the night. However, the party scene is restricted by complaints from nearby hotels about the noise, and also the prohibition of alcohol. 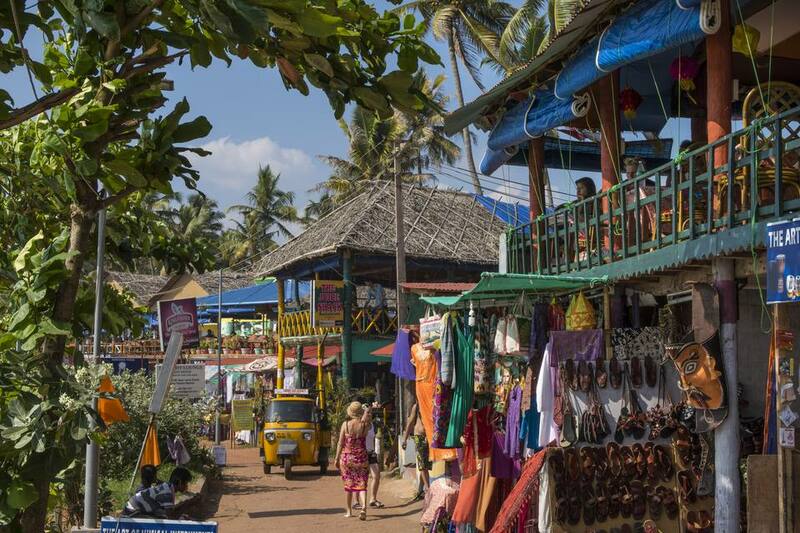 As Varkala is a holy town, none of the beach shacks are licensed to serve alcohol, although this doesn't stop them from doing so after paying adequate compensation to the local police. Other nightlife includes traditional Kathakali dance performances in the evenings. Varkala has undergone a dramatic amount of growth in just a few years to be transformed from a sleepy village into sought after beach destination. This has had a significant impact on the locals. Females should take particular care around local men, as incidents of drunkenness and groping are common. Many foreign women also end up being charmed by the staff from the beach shacks, who usually end up wanting money or are married. Begging and hawking are becoming issues as well. Also, bring a flashlight as power cuts are prevalent. At the beach, swimmers should be aware of strong currents and not swim out too far. An important thing to keep in mind is the interesting tide pattern at Varkala. This sees Papanasam Beach completely immersed in the ocean during the monsoon season, while the Black Beach is accessible. After the monsoon, this trend reverses with the Black Beach becoming engulfed in water and Papanasam Beach open. Therefore, if the beach is important to you, during the monsoon season it's best to stay at the northern end of North Cliff near Black Beach. In peak season, the southern end of North Cliff provides the easiest access to Papanasam Beach as the stairs leading down the cliff are located there. It's cheaper to stay around South Cliff and the beach there. However, the North Cliff isn't readily accessible from this area (which suits people who want to avoid the crowds!). This end of Papanasam Beach also remains isolated from the tourist part of the beach until the monsoon fully retreats and the beach completely opens up. Therefore if you want to go up to the cliff from there, it's necessary to take an auto rickshaw.